Angels have long been believed to possess the power to protect, console and heal, especially during difficult times. 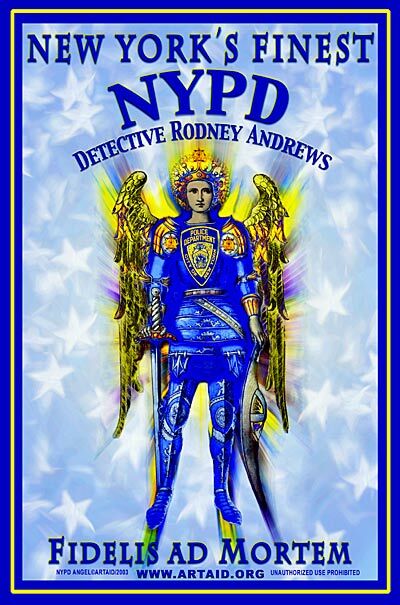 This particular image, based on the Guardian Angel Saint Michael was chosen for its inspiring beauty, strength and courage, qualities that characterize the men and women of the NYPD who risk their lives every day to help others in their times of need. First deaths in the line of duty since September 11, Detective James V. Nemorin and Detective Rodney J. Andrews were shot and killed on Monday, March 10, 2003, during an undercover operation while attempting to purchase illegal firearms on Staten Island. Honor Guard Officer Maloney receives New York's Finest at site of Memorial. NYPD Detectives Honored on Anniversary. 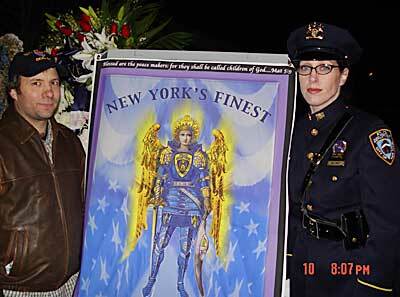 NEW YORK, --March, 10, 2004, Hundreds of uniformed Police officers of the NYPD, friends and family members gathered on the spot to honor 2 detectives slain in the line of duty one year ago. Inspector Vinnie Dinato (left) helped organize a very special event. 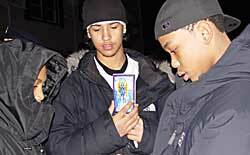 Donations for the children of the slain detectives - Rodney Andrews and James Nemorin - may be sent to the DEA Widows' and Children's Fund, 26 Thomas St., New York, N.Y., 10007. With attention given to: March 10th Undercover Fund. This artwork sponsored by Millennium Protective Services, Inc.